A beautiful big rose bouquet adorned with green foliage comes with two 8� super cute bear! A perfect gift. 1. 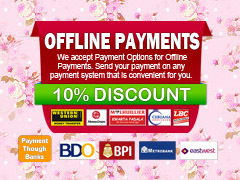 We do same day delivery for Metro Manila provided that we received the order BEFORE 10AM. Orders received after 10AM will be shipped the next day. 2. We can't do same-day delivery for provincial deliveries. 3. We only ship items from 11AM to 7PM. We don't deliver items earlier or later than that. 4. We cannot give you the exact time of delivery. If you want an order to be delivered at a specific time, please order at least 4 days in advance. 5. We charge $6 shipping regardless of location. 6. Item may vary especially if a certain item is unavailable. This may be because a certain flower or fruit is out of season, a chocolate is unavailable or a certain design or color is not available. Nevertheless, we'll inform you if a change is done. We strive to maintain the overall look, value and quality of the product. 7. Please provide the complete address. Incorrect addresses might cause a delay in delivery. Make it a habit to include the House#, street name, Barangay name and contact number of the recipient. Item will not be shipped if the address is not complete. 9. The vase or basket may not be included for provincial deliveries or it might be sent in a separate box leaving the flower assembly to the recipient. 10. For Hospital Deliveries: please make sure the recipient is still in the hospital before scheduling the delivery. Just one look our flower bouquet selection anyone will be amazed. We have flower arrangements for just about any type of occasion. We have heart-shaped bouquets that are created just in time for Valentines Day. In fact, these are the best selling bouquets for the upcoming occasion. You will also love Regalo Manila because the flowers are sent fresh. Unlike other flower shops that only preserves their flowers; Regalo Manila gets their flowers on the same day and creates the arrangement on the spot. Regalomanila provides same day flower delivery metro manila. They can do this because they have expert florists working with them. This way, the company can ensure that all of their flowers are sent to their recipients in the same state as they have created them. With over 10 years in the business, the company is dedicated to sending flowers to Philippines on time. With Regalomanila.com, there is now a service that OFWs and foreigners can go to when they want to send flowers to Philippines their loved ones even if they cannot be physically present for them. With this service, they can now easily send flowers and other food items to their loved ones even if they are currently residing in another country.